Berries were picked for the May #BundtaMonth theme. The magical baker/bloggers behind this monthly event are Anuradha of Baker Street  and Lora, the Cake Duchess . A strawberry Bundt cake was a no-brainer choice. 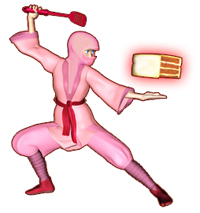 The red gems of natural sugar contain many happy memories for this Ninja Baker. As a kid, I visited my mom in the summertime in Cambridge, Massachusetts. Our desserts often consisted of Cool Whip and ice cream topped with strawberries. In my 30s, I raised my glass of champagne with strawberries to celebrate the marriage of friends who met later in life. While a harp played, I also enjoyed tea, strawberries and cream at the Plaza Hotel during a vacation in New York with my sister. Even if you don’t have lovely associations with strawberries, you won’t forget the blissful bites made from the recipe below. 1. In one bowl combine cake mix, milk, oil and egg yolks. Scrape bowl as necessary. Mix thoroughly. 2. In a separate bowl, whip up egg whites with a pinch of salt and the cream of tartar until stiff peaks appear. 3. Gently incorporate the whipped egg whites into the bowl with the cake mix, oil and egg yolks. 4. Pour into a Bundt pan that has been sprayed with Pam and coated with panko breadcrumbs. 5. Bake at 350 degrees for 40 to 45 minutes. Or until a toothpick inserted into the center comes out clean. 6. Allow the cake to cool. 7. In a chilled bowl, beat the powdered sugar, heavy cream and vanilla into whipped cream. Insert a star tip into a piping bag and fill with the whipped cream. 8. Pipe the cream on top of the cake. Writing about sweet moments connected with strawberries makes me happy. But also saddens me when I think of the lives lost in the Boston Marathon. (The city holds a special place in my heart. Boston is right across the Charles River from Cambridge –where I visited my mother during summer vacations as a child.) I get to dance, attend more weddings, eat more strawberries and enjoy life! Eight-year-old Martin Richard along with others are no longer here. Dance instructor, Adriane Haslet  survived but lost a foot. She vows she will dance again. It may be a tough road. To honor all the sweethearts who suffered the loss of loved ones and setbacks at the last Boston Marathon, I’d like to dedicate this post. I’ve included a link to the Salvation Army here . If the spirit moves you, please contribute funds to this noble organization (or any other relief effort) which is helping to heal the aftermath of this year’s Boston Marathon. On a lighter note, contributions of more berry Bundt delights await you below. We have a berrilicious theme t for #Bundt-a-Month May. 14 gorgeous cakes using berries in every form will be inspiration enough for you to bake with us this month. Here ís how you can be a part of Bundt-a-Month: • Simple rule: Use your favorite berries or a combination of two and bake us a Bundt for May • Post it before May 31, 2013 • Use the #BundtaMonth hashtag in your title. (For ex: title could read #BundtaMonth: Cherry Bundt) • Add your entry to the Linky tool below • Link back to our announcement posts Even more Bundt fun! Follow Bundt-a-Month on Facebook where we feature all our gorgeous Bundt cakes. Or head over to our Pinterest board for inspiration and choose from hundreds of Bundt cake recipes. Wishing you the joys of strawberries and sweethearts in your dance of life.